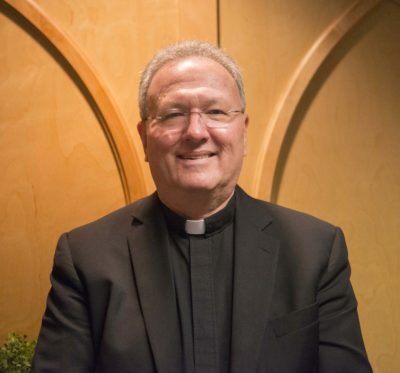 On May 17, two days after Bishop George Leo Thomas was installed as the third bishop of the Diocese of Las Vegas, the College of Consultors elected Monsignor Kevin O’Neill as the Diocesan Administrator for the Diocese of Helena. In this role, Monsignor O’Neill will collaborate with the College of Consultors to perform the duties generally associated with the office of the bishop, with the exception of some limitations of nature and law, until a new bishop is appointed to the diocese. During the inter regnum period between bishops, the law states that there can be no innovations, but the work of the diocese can be conclusive and continuous. Many functions and ministries of the church continue on as normal. Monsignor O’Neill brings many years of experience to his role, not only in serving as Vicar General for the diocese for the last eighteen years, but also serving as the previous Administrator from 2003-2004, bridging the period between Bishop Robert Morlino and Bishop Thomas. The role of Vicar General concluded with the announcement of Bishop Thomas’ departure, as the title must have an ordinary — an appointed bishop — to function. Once Bishop Thomas was appointed as the Apostolic Administrator, he was no longer an ordinary in the diocese, and appointed Monsignor O’Neill as the Apostolic Administrator’s Delegate, which held all the same responsibilities as the Vicar General that canon law allows. That role ceased with Bishop Thomas’ installation in Las Vegas. The role which has remained constant through all of the transition and change has been his duties as the pastor of the Cathedral of St. Helena, which will continue through his term as Diocesan Administrator. The time until a new bishop is appointed by decree of Rome is never certain, historically, our diocese has experienced 6-12 months inter regnum. Monsignor O’Neill will serve as Administrator for the diocese throughout this period, but is joyfully anticipating the announcement of our next bishop.